How to lay Laminate Flooring so it looks like it grew there! Hugely popular over the last few years, Glueless click together floors are marketed as something anybody can install as a simple DIY project. This is true to a certain extent. However, it is not quite as easy as many people think and I've seen some serious bodge jobs! Below is a picture of some DIY flooring I saw in a house I was doing some other carpentry work in. Needless to say if you get it wrong it looks sh#t! There are a few simple steps that get missed at the beginning that ruin what could be a nice addition to a home. 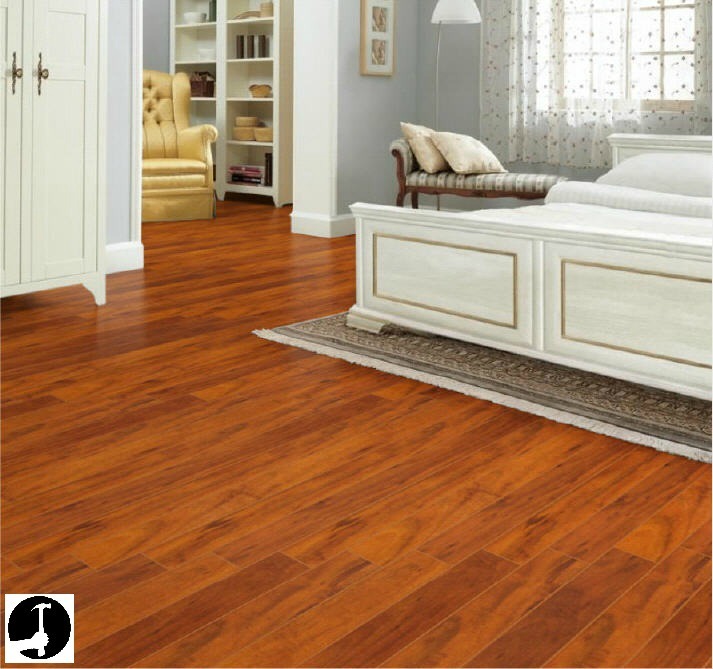 Lay laminate flooring properly and even a cheap wooden floor can actually still look really good. The opposite is true also, spend loads on good quality laminate floor boards, lay them like in the picture above and not only have you wasted a lot of money on a floor that won't last as long as it could, but it looks crap too. How do you calculate how much laminate flooring and beading you need? It's easy to calculate the amount of flooring and underlay required in a square or rectangle room. To work out the square area of the floor, simply multiply the length in millimeters by the width in millimeters (swap meters for feet and inches if you work in imperial). When calculating how much underlay is required, I don't normally add anything extra for wastage because the off cuts can be re-used, just round the figure up to the nearest size the rolls or sheets come in. However when I am calculating how much flooring is required, I add between 5 and 7% to allow for wastage (multiply the total by 1.05, or 1.07 to add 5 or 7 %). If you've never laid a floor, it might be worth adding 10% for waste. If you want to work out the amount of flooring required in an L shaped room, treat it as two separate square/rectangle areas and use the method described above for each. Then, simply add the two answers together before calculating and adding on the additional amount for waste. 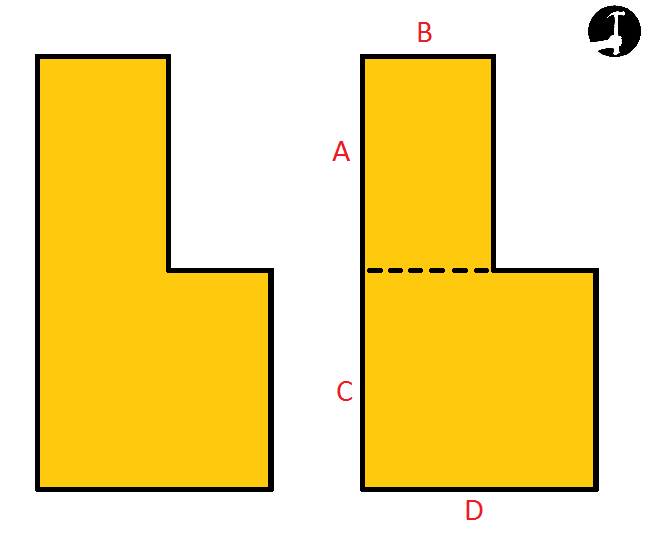 So looking at the picture above you would multiply A by B, multiply C by D and add the two measurements together. If you or the customer has a tight budget to stick to, once you have worked out how many square metres you need you can divide the budget by the number of metres required to calculate how much you can afford to spend per metre on laminate floor boards and underlay. Some floors are available with the underlay attached to the underside which may be the best option if working on a tight budget. Most types of flooring are supplied in packs that contain between 2 and 3 square metres. Divide the amount of flooring required by the contents supplied per pack. Whatever the answer, round it up to work out how many packs of laminate flooring are required. After you have laid the floor you will need either a beading or skirting boards to cover the expansion gap left around the perimeter of the room. For this, measure the length of every wall in the room. That is all the way round the walls where the beading or skirting will be required (excluding doorways), then simply add all of the lengths together. Add a further 10% for wastage this time, by multiplying the answer by 1.1 in your calculator. After you lay laminate flooring and are ready to install the beading or skirting boards, cut all of the long walls first and leave the short lengths until the end. By using all of the off-cuts for the shorter pieces instead of cutting them from full lengths, you will have the least amount of lengthening joints to cut. Not only does it look better but there is less wastage and less cutting to do! How to lay laminate flooring: Which tools do you need? It doesn't matter if you know how to lay laminate flooring, if you don't have the right tools it will be impossible to get the job right! I have put together a whole page containing a full list of the tools I use to install laminate floors with as there are quite a few. Click here to see the full laminate flooring installation tool kit! Which is the best laminate flooring underlay to use? The underlay is important, there are several different factors and types of underlay to consider and some are better than most. How do you lay laminate flooring? How do you negotiate doorways when laying laminate flooring? One of the most common areas people struggle with is how to lay laminate flooring through or around door ways. Instead of leaving a 10mm expansion gap you cut the thickness of the flooring off of the bottom of the architrave and frame. Use the comments box below to add your own tips or advice when it comes to laying laminate floors!